Posted Sep 28, 2017 by Eds. 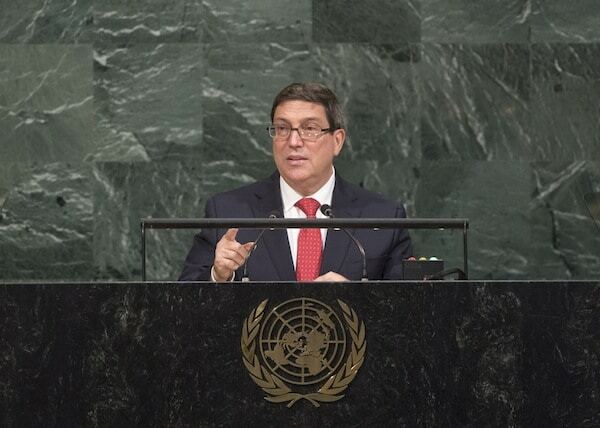 I want to convey the testimony of the people of Cuba, who are currently carrying out a colossal effort to recover from the severe damages caused by hurricane Irma to housing, agriculture, the power system and other services. Despite the all encompassing preventive measures – which included the evacuation of more than 1.7 million persons- and the full cooperation of all citizens, we suffered the loss of ten persons. The moving scenes of rescuers saving a girl and giving her back to her mother; of a little boy picking up a bust of Jose Marti from the rubble; of students helping families they had not met before; of soldiers from the Armed Forces and the Ministry of the Interior doing the toughest jobs; of local leaders heading the most difficult tasks have become all too familiar. Eight hundred and fifteen million persons suffer from chronic hunger -tens of millions more than in 2015. Two billion are undernourished. Even if the precarious decreasing growth rate of recent years rebounds, 653 million persons will continue to face hunger by the year 2030, and this will not be enough to eradicate hunger by the year 2050. Could the several decades of bloody military dictatorships in Latin America be referred to as an example of a successful capitalism? Does anyone know of any recipe of neoliberal capitalism that has been better applied than those which destroyed the Latin American economies in the 1980s? The U.S. government has come here to tell us that, in addition to prosperity, the other two “beautiful pillars” of international order are sovereignty and security. Weapons under the auspices of the United Nations, which proscribe the use and the threat of use of those weapons that have the capacity to annihilate the human species. The U.S. President manipulates the concepts of sovereignty and security to his exclusive benefit and to the detriment of all others, including his allies. The principles of sovereign equality, respect for the territorial integrity and non interference in the internal affairs of States should be observed. The UN Charter and International Law admit no re-interpretation. The “patriotism” invoked in the U.S. statement is a perversion of humanism, the love and loyalty to the homeland and of the enrichment and defense of national and universal culture. It embodies an exceptionalist and supremacist vision of ignorant intolerance in the face of diverse political, economic, social and cultural models. The day before yesterday, the U.S. Vice-president, Michael Pence, ridiculously ignoring the functions of the Security Council and attempting to establish new prerogatives, said that this organ should modify the composition and methods of the UN Human Rights Council, which “doesn’t deserve its name” because “a clear majority of the Human Rights Council members fail to meet even the most basic human rights standards”. I suppose he is not including, in this case, his own country, which will in fact deserve to be included because of its pattern of systematic violations of human rights, namely the use of torture, arbitrary detentions and imprisonment -as occurs at the Guantanamo Naval Base-, the assassination of African Americans by law enforcement agents, the killing of innocent civilians perpetrated by its troops and the xenophobia and repression against immigrants -including minors- as well as its scarce adherence to international instruments. We reaffirm our strongest condemnation against all forms and manifestations of terrorism and reject the double standards in combating them. Revolution through unconstitutional, violent and putschist methods will shoulder a serious responsibility before history. We reiterate our unwavering solidarity with the Bolivarian and Chavista government and people and its civic-military union led by the constitutional President Nicolas Maduro Moros. We denounce and condemn the NICA Act Initiative, promoted in the U.S. Congress as part of an interventionist behavior which is intended to impose an economic blockade against the people and the government of Nicaragua, to whom we reiterate our support. Party and the Brazilian people will always find Cuba on their side. We support the legitimate claim of Argentina for the sovereignty over the Malvinas, South Georgia and South Sandwich Islands. On June 16 last, the president of the United States, Donald Trump, announced the new Cuba policy of his administration, which is a setback in U.S.-Cuba bilateral relations and undermines the bases established two years ago to advance towards a new type of relation between our countries, characterized by respect and equality. The U.S. Government has decided to tighten the economic, commercial and financial blockade by imposing new obstacles to the already limited possibilities its business community had to trade with and invest in Cuba as well as additional restrictions on U.S. citizens willing to travel to our country. Florida, which is an ever more isolated and minoritarian group that insists in harming Cuba and its people for having decided to defend, at all costs, the right to be free, independent and sovereign. Today we reiterate our condemnation of the measures aimed at tightening the blockade and reaffirm that any strategy intended to destroy the Revolution will fail. Havana we categorically affirm that the Cuban government rigorously and seriously abides by its obligations under the Vienna Convention on Diplomatic Relations in relation to the protection and the integrity of all diplomats without any exception, including those from the United States. Cuba has never perpetrated nor will it ever perpetrate actions of this sort. Cuba has never allowed nor will it ever allow its territory to be used by third parties with that purpose. The Cuban authorities, based on the preliminary results of the priority investigation that is being carried out with a high technical component, following instructions from the top level of our government, has taken into account the data contributed by the U.S. authorities and so far has found no evidence whatsoever that could confirm the causes or the origin of the health disorders referred to by U.S. diplomats and their relatives. The investigation to clarify this issue continues, and in order to be able to arrive to a conclusion, it will be crucial to count on the cooperation of the U.S. authorities. It would be unfortunate if a matter of this nature is politicized. As was expressed by the Cuban President Raul Castro Ruz, Cuba is willing to continue negotiating all pending bilateral issues with the United States, on the basis of equality and absolute respect for the sovereignty and independence of our country; and maintaining a respectful dialogue and cooperation in areas of common interest with the U.S. government. “Necessity of ending the economic, commercial and financial blockade imposed by the United States of America against Cuba.” While inequality, the opulence of a few and the marginalization of many are growing in today’s world, the Cuban people will keep up its struggle to achieve the most just society possible. We will continue to steadily advance down the path of revolutionary transformations that has been sovereignly chosen by all Cubans to further improve our socialism.